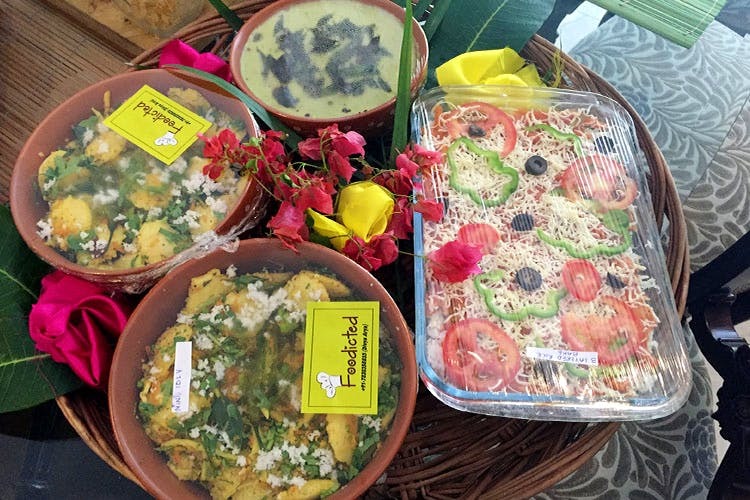 Foodicted is a catering service which provides delicious vegetarian food for parties and gatherings of all sizes. They make high quality international gourmet food and have a wide range of dishes on their menu. Started by Divya Arya (the head chef), Foodicted is the new go-to catering service if you’re planning to host a party (or if you’re really, really hungry). And since the festivities are upon us, you can depend on their international gourmet dishes to either spice up a big win or console if it’s a hard loss. Their extensive menu ranges from healthy salads, various appetisers, chaat, small bites, Continental bakes and more. Their forte lies in Mexican, Italian, Continental, Oriental, and Thai but they’re open to any cuisine you might have in mind. They recommend and customise the menu and dishes according to the nature and size of the gathering. We wish they had a website for easy browsing, ordering, and categorisation – we hope they get one soon. We suggest calling them and getting a menu over WhatsApp – that'll give you a better idea and will help you plan your order in advance.